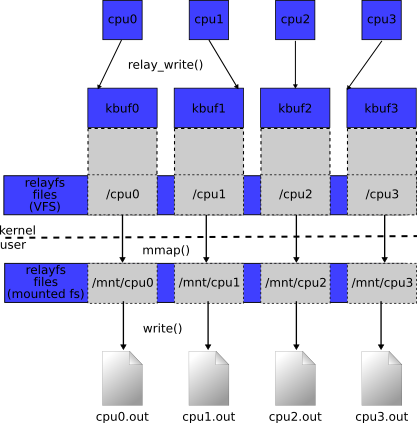 Relay (Relay filesystem) is a mechanisim used to transfer the data from the kernel space to the user space within the Linux OS. The advantage of relay comparing with other means like debugfs or proc is its ability to handle the big data efficiently. This post will show an example of relay using kernel 3.9.6. May it help. relayArp.c under km is the kernel module used to pop up 2 ARP msgs from the kernel space to the user space; relayArp_us.c under us is the user-space programe used to read and decode the 2 ARP msgs from the kernel. All the code could be found in github below. Only key points and running results are listed here for the reference. * create_buf_file() callback. Creates relay file in debugfs. * remove_buf_file() callback. Removes relay file from debugfs. This entry was posted in OS, Programming and tagged debugfs, kernel, Linux, relay, relayfs. Bookmark the permalink.